I’m coming off two weeks of study leave. What a treat. I spent more time with my family, watched a few football games, wrote several chapters, and made it through most of the Lord of the Rings (the movies). I also took a break from blogging and tweeting. Now, I have to be honest. I still checked email and tried to take care of the most pressing emails every few days, but it was nice to feel like I could let them sit around. I still checked twitter occasionally and read a few blogs now and then. But my online reading habit was greatly curtailed. More importantly, I didn’t write a single tweet or post an article on my blog for two weeks. I’m not going to lie, it was nice. Don’t worry. There’s no guilt trip coming for checking Facebook and Twitter or surfing the blogs. The Holy Spirit can convict if necessary. There’s nothing intrinsically wrong with social media, and plenty that’s good. At least I hope so (I am coming back to twitter and my blog after all). I won’t even suggest you must take a break from social media for a week or two. Maybe your consumption and production is under control. But I think you should consider a fast periodically—for a few days, a week, or maybe longer. Here’s how I benefited from being away (more or less) for two weeks. 1. I checked the internet less. I hate to say it, but I find the web less fascinating when I’m not on it! For two weeks I didn’t need to read any blog comments. I didn’t check my “mentions” or my “likes.” And because I wasn’t swimming in the virtual deeps, I wasn’t distracted by what others might be saying about me. All in all, it meant less time roaming around with no particular purpose. 2. I thought about myself less. I wasn’t a “player” in the blog world for two weeks. I wasn’t ruffling anyone’s feathers. I wasn’t hitting anyone’s sweet spot. I just wasn’t around (virtually speaking). Consequently, I didn’t need to think about how I was being received or what response I was getting. I think I’ve grown in this area a lot in the past couple years, but the break was still refreshing. 3. I read more books. True, I didn’t have meetings at night or church pressures on the weekend. That was a big part of it. But without as much time online I found myself with more time to read books after the kids were in bed. As I heard recently, there are two types of people in the world: those who read blogs and those who read books. An exaggeration to be sure, but with a bit of truth. 4. I felt free to keep my opinions unstated. Novel thought I know, but easier said than done for some of us. During my break I saw little skirmishes in the twitterverse or blogosphere come and go. I heard things in the news that I might want to comment on or had thoughts I wanted to share. But for two weeks it was freeing to think, “I won’t weigh in on any of it.” Obviously, I’m blogging again so I think there is value in “weighing in.” But cutting yourself from the urge to endless commentary is extremely healthy. 5. Social media drives us–relentlessly, punishingly, inexorably–to the now. It gives us the illusion of being up to date, current, relevant. And it shames us when we don’t know the newest meme and this week’s viral video. The medium does not encourage slow reflection or push us to the wisdom of the past. We need to fast from the information feast, lest we gorge ourselves on trivialities. 6. It’s good to remember that the world goes on fine without us. Sure, we have people out there that genuinely care for us and (hopefully) benefit from our social media output. But sometimes we act like caged hamsters running in the social media wheel, just hoping we provide enough content and witticism to keep the world going. We’re not that important. 7. Social media takes time. Taking a break gives you more time to do something you’re not currently doing, like watching Lord of the Rings, reading a book, running a 5k, paying attention at the dinner table, or saying your prayers. 8. 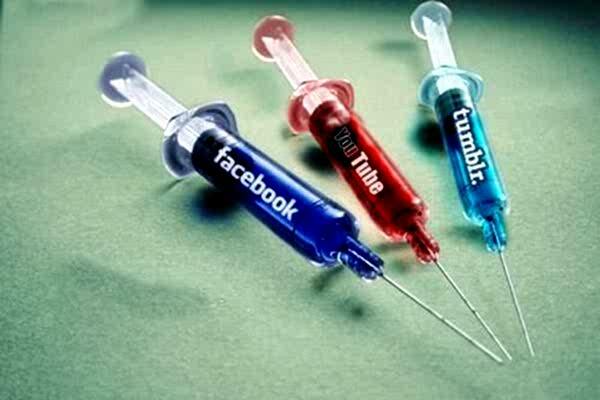 If you can’t stop, you might be addicted. It was good to be away. I’m glad to be back. I look forward to being gone and back more regularly.